Last Saturday, Oakland Urban Paths and Annalee Allen of the Oakland Walking Tours program collaborated on a special walking tour exploring the Oakland of author Jack London. While Oakland has changed a lot since Jack London's time, there are still a lot of connections to the Oakland he would have known. 71 people (and 2 dogs) braved the chance of rain to join us. The logical place to start on a Jack London tour is Heinold's First and Last Chance Saloon in Jack London Square. Jack studied there as a child, and based some of the characters in his writing on the sailors and others he saw there. And later, Johnny Heinold loaned Jack the money to attend the University of California (though Jack decided after a year that university wasn't for him.) On the back of Heinold's is a large mural called "Hello Jack" that features things from Jack's life: Jennie Prentiss, the woman born into slavery who did much of the raising of Jack; his cabin in the Yukon; the Snark, his boat that he sailed the South Seas on; Wolf House, the mansion he and Charmian had built in Glen Ellen; and more. The cabin from the Yukon is just beyond the deck of Heinold's. Well, part of it, anyway. Part is in Dawson, part is in Oakland, and pieces have been replaced as needed. From Jack London Square, we went up to the Oakland Grill, where Jack is featured in another mural, along with other figures from Oakland's history. Then it was up to Lincoln Square in Chinatown, where we talked about Jack and Charmian's South Seas voyages, Jack's photography, his time as a war correspondent, and his portrayal of other races in his writing. Jack was raised by a black woman, but wrote about a "great white hope" to defeat black boxer Jack Johnson; he wrote about the "yellow peril" of Asian immigrants, but also wrote full, rich characterizations of non-whites in some of his novels; etc. We walked past the Hotel Oakland. When it was completed in 1912, Jack and Charmian had moved to Beauty Ranch in Glen Ellen, but it would have been a notable new presence during his return visits to Oakland. A short distance away is the original site of the University of California. By the time Jack attended in 1897, the university had moved to its newly-built campus in Berkeley. But one of the buildings of the original campus became the Dietz Opera House, the first theater in Oakland. Jack later spoke to audiences there, and the local Socialist party had their headquarters in the building. On the way to the Jack London Oak in Frank Ogawa Plaza, we passed by the Athenian-Nile Club building. Built in 1901, Jack would have known it, because it was home to the "power elite" of Oakland and was just down from city hall and the Oakland Free Library. The oak tree wasn't planted until one year after Jack's death. Further down 14th Street, we stopped between the African American Museum and Library of Oakland (AAMLO) and the First Unitarian Church of Oakland. We talked more about Jenny Prentiss, who took Jack to church at the First African Methodist Episcopal Church (First AME), and about Jack's first wife, Elizabeth "Bessie" Maddern, who attended the Unitarian church. Heading back towards Jack London Square, we stopped to talk about the Hickmott Canning Company and Cole Grammar School in West Oakland. The Hickmott cannery was at 1st and Filbert, and was where Jack had one of his first jobs—stuffing pickles into jars, for 10¢ an hour, working 12-18 hour days. The noisy, dangerous conditions doubtless helped shaped some his views on workers' rights. Jack attended school at Cole, where J.P. Garlick was principal, and Jack's love of books was apparent: according to classmate Frank Atherton, Jack was "occupied with books. Not only did he apply himself diligently to his studies during class, but also during recess and the noon hour, he would sit on one of the benches in the school yard, reading some strange tale of romance and adventure, while other boys and girls were at play. ...he read many books some seeming far beyond the comprehension of a ten year old boy. And it was remarkable how well he remembered the details of so many stories." And Jack was no stranger in principal Garlick's office. 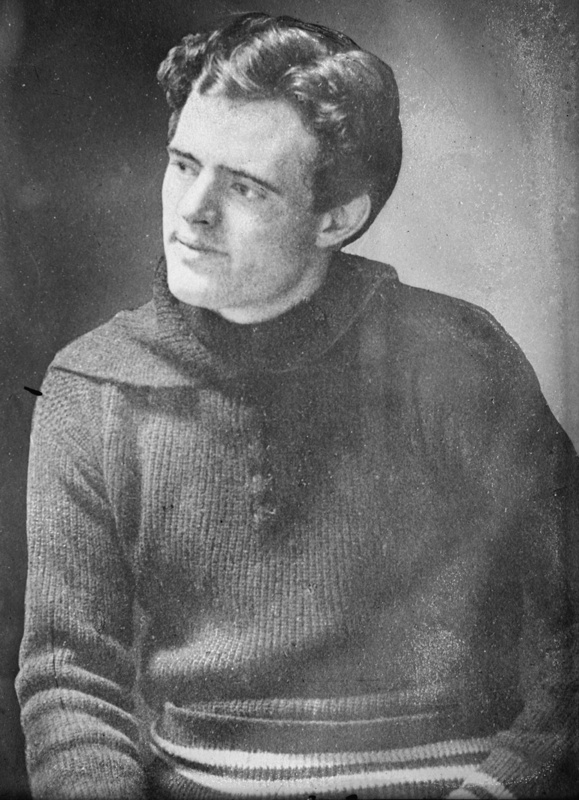 Author James L. Haley in The Lives of Jack London wrote: The leader of the Cole School toughs was a budding young thug named Mike Pinella, who called Johnny a sissy, threw a book he was reading across the schoolyard, and was surprised to learn the "sissy" could hold his own. Both boys ended up in Mr. Garlick's office, who ruled that they would not be punished if they would embrace and make up. Mike Pinella was willing, but Johnny, his keen and growing sense of injustice offended, refused. "I'll take the licking, Mr. Garlick," he said. "I know I was in the right, and I'll do it again if I have to." A brief rain shower sent a lot of people to their cars or other destinations, but others stuck with us to the end of the walk at the statue of Jack London at the base of Broadway. Thanks to everyone who came out for the walk. We hope to do the walk again later this year, though no date has been set.